I've been giving this some thought lately. Perhaps it's that Jack has started preschool, but I've been feeling a bit contemplative about my role as "Momma". So, I thought I'd create a little meme with just a few random things this motherhood journey has taught me. 1. Black Cherry Kool-Aid is not my friend. It used to be one of my favorite drinks. However, it turned into a nemesis like no other. It will find its way into the hands of toddlers and onto white carpet, white shirts, white everything. And, I can dump a gallon of bleach into the washer, and it won't come out. Yet, I get one tiny spot of bleach on one of Jason's navy blue shirts, and it creates a perfectly white spot. Go figure. 2. I used to know it all. I was going to have a baby that slept through the night in the hospital, was potty trained at 18 months, never picked his nose and ate it, never threw a temper tantrum at church or the grocery store, and never, ever talked back. My child was certainly not going to be like those other kids whose mothers weren't doing things right. My words. I've eaten a belly full of them. 3. Sleep. Oh, how I love thee. With a deep, deep passion. I took thee for granted. I did not appreciate thee. Jason and I have decided that we are sleeping away our retirement. 4. Single mothers are the strongest women I know. I marvel at their courage and strength and sacrifice. 5. A mother's love is fierce. I never imagined I could love anyone as much as I love Jason. But, the minute I looked at each of the boys, I felt a love so fierce that dying for them wouldn't require a second thought. 6. There will be poop. Lots of it. The idea of changing poopy diapers is cute and laughable for a soon-to-be Momma at her baby shower. "Hee hee" the experienced mothers smile and say with a knowing twinkle in their eye. No one tells you that poop will blow up the back of a onesie like a rocket ship taking off. No one tells you that the smell in your house will rival the little league port-a-pot while you're potty training. And, no one EVER tells you that talking about the texture, size, frequency, and color of poop will become part of your daily conversations with your sister and friends. 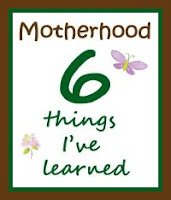 And, on that pleasant note, I'd love to hear what some of you other Moms have learned. Feel free to post something you've learned in the comments or grab this little meme for yourselves. I so agree with you on eating your words- I've got a belly full too! I've also said I could never be a single mother- I can't imagine!! I've also learned that as much as they frustrate me sometimes- I love them even more than that. They are God's greatest blessings! The only thing I would add to number 1 is that I had no idea how much Spray n' Wash I'd go through. Ugh. But, it works! i don't have too much to contribute here, but i'm curious to come back and read the comments later on today. on the poop front, however, i dealt with some significant diaper explosions while babysitting in HS. i mean, i remember seeing this kid covered waist-down in crap and wondering where to even start cleaning. do you try for wipes first, then the tub? or go right for the tub? ick. That was wonderful! I may have to give it a try. My blogging has gone dry. Check out the post I did today on poop.... I totally get you girlie! What a fun meme you've got goin' on today. Can I play later this week if I link back to this post? I like this - if I get the time I may do it tomorrow. By the way, sheep poop doesn't come out very well either. Just let your soon to be five year old fall into it on a class trip...yuck! I've learned that being a mother is the most rewarding and difficult job ever. I have loved and hated being a mom. I love having children and hate not feeling like I'm perfect...go figure. Beautiful and well said. I found myself laughing, with you of coarse and going “oh baby how I remember . ."
Something I’ve learned, no matter what our college degree may be or how knowledge we are, at some point in our children’s lives (like ages 9 through married life) parents just don’t know ANYTHING! Can you guess how my day went? I am cracking up at Lauren's comment because I think of her (and her parents) every time I see red juice of any kind. Love your list. Well said. I'm in a list-mode this week - maybe I'll tack this one on at the end! I could not be a single mother. Parenting is way too hard alone. I agree that a mother's love is fierce - like a female bear. Don't you dare hurt my kid!!! "There will be poop. Lots of it." LOL. Yup. Who'da thought all that could come from a little t*ush. Being a mom is awesome I agree. And as the saying goes, it is also the hardest job you'll ever do. I go to work just to get "break"! I agree with all of it, and laughed heartily at #6. I wan to put some thought into this and do this when I get a chance - love the graphic for it! Thanks for the tears and laughs Sarah! I enjoyed doing this one for myself as well! Oh, how i agree with all of them...especially the poop! There are days, taht i say aloud, " I AM SICK OF PPPOOOOPPPP!!" I don't remember how I found your blog, but thanks for this meme! I actually did this meme on my blog-hope that's ok!